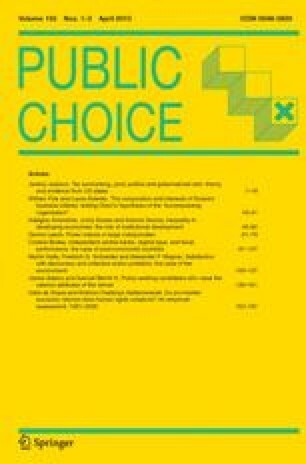 This paper provides the theoretical perspective and empirical support for congressional dominance of agency decisions. My thesis is twofold. First, because much of the previous evidence on this question is not evidence at all, many scholars' intuition and conclusions are based on a logically flawed foundation. Second, I have provided here and in previous work a look at a variety of different agencies, and in each case, have shown how the events can plausibly be interpreted as involving Congress. Agency problems within the congressional-bureaucratic system are real and substantial just as they are within corporations. However, as in the latter, institutional forms develop within the congressional system to partially, if not wholly, mitigate these problems. The logical perspective together with the evidence provide a strong case against the agency-dominance hypothesis (as typified by the early sections of Niskanen 1971 and Wilson 1980). Several tentative generalizations for deregulation emerge from this perspective. (1) Policy change requires that congressmen perceive political net benefits from the change. If this involves a change in constitutencies, then members of the relevant committees must be willing to give up their current constitutents. For the SEC, the rise of the institutional investors provided such an opportunity. For the ICC and the CAB, the political credit to be gained from deregulation is less obvious and provides a major unresolved issue in the economic theory of regulation. (2) “Market testing,” as undertaken by the SEC, is probably a regular component of the congressional-bureaucratic system. A congressional committee allows an agency to test the waters and generate information about the political effects of a policy change. If the policy change appears politically successful, then Congress provides a statutory underpinning, perhaps extending significantly the scope of the experiment. If it is unsuccessful, then Congress moves to reinstate the status quo. Clearly, there were significant elements of this in the case of the CAB. Congress allowed deregulation-minded economists and lawyers (e.g., Kahn, Bailey, Levine) to take control of the Board. To their credit, these individuals were able to initiate rate deregulation within existing legislation. This proved so successful that, though the final legislation in 1978 significantly extended the bounds of deregulation, it seemed but icing on the cake. (3) The above perspective points up the role of Congress in maintaining policy equilibrium. As the history of the SEC demonstrates, we must examine events preceding the deregulatory period. The evidence reveals that plausible hypotheses about SEC policy change make little sense when studied in the context of thirty-years worth of Commission activity. Similarly, an explanation of CAB or ICC deregulation must not only explain why it occurred in the late 1970s but also why it failed to occur during the previous thirty years. Every president during this period tested the waters of, or actively sought, transportation reform. Yet, prior to the late 1970s, none was successful because the relevant committees rebuffed these efforts. (4) Finally, while marginal accommodations to changes in group composition (to paraphrase Mackay and Reid, 1979) occur within the congressional system, policy remains stable as long as the relevant groups remain stable. This implies that for the near future, substantial progress toward reform or deregulation is unlikely for most social regulatory agencies. This paper suggests the necessary role of Congress in the regulatory policymaking system. Regulatory change, whether halting FTC activism or deregulation as undertaken by the SEC, constitutes a change within the congressional system. While I have argued an extreme view — namely, that Congress is of supreme importance — the evidence is consistent with it. But this view is used primarily to show that the other extreme — agency dominance — seems clearly inconsistent with the evidence. Whether the congressional-dominance hypothesis or a more moderate “shared-influence hypothesis” is more descriptively accurate is not my concern here. Rather, my fundamental premise is that the assumption that Congress controls regulation will prove as useful in understanding regulatory behavior as the assumption that firms maximize profits has proved to be in economic analysis of market behavior. Associate professor of economics and business, and research associate at the Center for the Study of American Business, Washington University. I gratefully acknowledge helpful comments from James Alt, Lee Benham, Randall Calvert, Harold Demsetz, Arthur Denzau, Kenneth Lehn, Mark Moran, and Kenneth Shepsle. Research assistance was provided by David Tsadka. Partial support was provided by NSF Grant SES-8311691.